Cairns Airport is the city's international airport, conveniently located just 10min/7km’s from the CBD and 20 min/26km's from Palm Cove. It provides the main gateway to North Queensland. Flights operate from Cairns Airport to all major Australian cities and tourist destinations, regional communities in Far North Queensland, and a number of international destinations in the Asia-Pacific region, with connections to the rest of the world. Direct domestic flights arrive daily from Brisbane, Adelaide, Gold Coast, Sydney, Melbourne, Perth, Darwin and Townsville as well as to Alice Springs and Ayers Rock (Uluru) and regional centres. Major domestic airlines including Jetstar, Qantas, Tigerair and Virgin. Cairns Airport is Australia's seventh busiest for international passengers with direct flights from Auckland, Tokyo, Osaka, Hong Kong, Guam, Shanghai, Port Moresby and to Singapore, via Darwin. International airlines include Jetstar, Air New Zealand, Qantas, Cathay Pacific and Air Niugini. There are a number of coach operators providing a door to door transfer service, these usually need to be pre-booked. On arrival at the Cairns Airport, you will be warmly greeted by your driver who will be holding a sign with your name on it. Once your fellow travellers are gathered and assuming your bags come out reasonably quickly, you will be on your way to Palm Cove, approximately 20 minutes after aircraft arrival-time for domestic flights (it may be up to an hour for international flights because of customs and other formalities). The longest established Coach Company in the area, Exemplar Coaches & Limousines offers a direct door to door service for airport transfers. You can view details and costings here. Please provide your flight details including flight number on booking. Car rental offices are located at the Cairns Airport in the arrivals terminal at the northern end of T2 (Domestic Terminal) and in the Arrivals Hall of T1 (International Terminal). It is recommend to prebook your vehicle in advance, especially during peak season school holiday times. The Spirit of Queensland travels from Cairns to Brisbane and all regions in between, operating five return services per week. 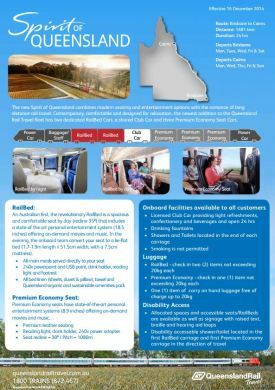 Offering modern seating and entertainment options plus the revolutionary RailBed Cars - an Australian first, a shared Club Car and three Premium Economy Seat Cars. Cairns Railway Station is situated in the heart of Cairns just a short walk from most CBD hotels. It is attached to Cairns Central Shopping Centre - the city's largest shopping centre. The terminus is wheelchair accessible, a bus stop and taxi rank is located here. If you are travelling with 3 or more people it may be more cost effective and convenient to take a taxi. Taxis are readily available at Cairns Airport at both the International and Domestic terminals, as well as the Cairns Railway Station and various taxi ranks in the CBD. Cairns Taxis comprise of sedans and station wagons for up to four passengers, maxi taxis for up to 10 passengers and wheel chair capable vehicles. Each taxi is equipped with electronic payment facilities enabling payment through all the major credit cards recognised in Australia. Live Flight Infomation is updated in real-time where you can see both arrival and departure times of flights around the region. 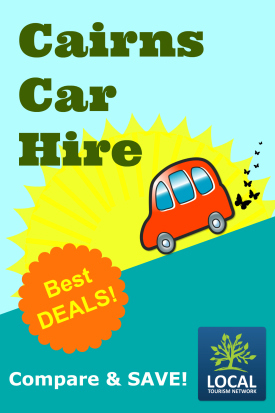 Car Hire is a great idea to explore the region. We have so many beautiful places to visit and self drive touring is a wonderful way to see the area if you want to travel at your own pace. We have many local companies up here. 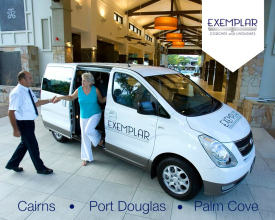 Exemplar Coaches and Limousines is a boutique transfer provider, with modern limousines and coaches servicing Cairns Airport, Palm Cove and Port Douglas. Cairns Taxis provide a door to door passenger transport service. View up to date fare information including flagfall, tariffs and booking fees. The new Spirit of Queensland combines modern seating and entertainment options with the romance of long distance rail travel. 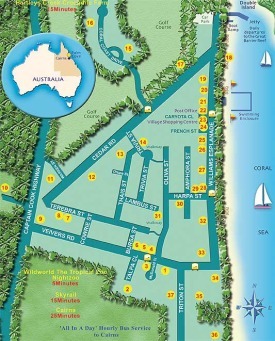 Palm Cove has a beautiful seaside village atmosphere. Most of the shops, cafes, resorts and restaurants are located along William's Esplanade. A walk along this beachfront strip takes approx 20mins.